The Uprising in Serbia was initiated in July 1941 by the Communist Party of Yugoslavia against the German occupation forces and their Serbian quisling auxiliaries in the Territory of the Military Commander in Serbia. At first the Yugoslav Partisans had mounted diversions and conducted sabotage and had attacked representatives of Aćimović's quisling administration. In late August some Chetniks joined the uprising and liberated Loznica. The uprising soon reached mass proportions. Partisans and Chetniks captured towns that weak German garrisons had abandoned. The armed uprising soon engulfed great parts of the occupied territory. The largest liberated territory in occupied Europe was created by the Partisans in western Serbia, and was known as the Republic of Užice. Rebels shared power on the liberated territory; the center of the Partisan liberated territory was in Užice, and Chetniks had their headquarters on Ravna Gora. The Battle of Loznica involved an attack on the German garrison of that town by the Jadar Chetnik Detachment on 31 August 1941. Following the World War II German-led Axis invasion of Yugoslavia in April 1941, the Kingdom of Yugoslavia was partitioned. At the time, Loznica was part of the German-occupied territory of Serbia, which included Serbia proper, with the addition of the northern part of Kosovo, and the Banat. 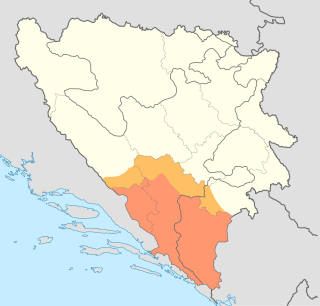 Herzegovina is the southern region of Bosnia and Herzegovina. While there is no official border distinguishing it from the Bosnian geographical region, it is sometimes asserted that the borders of the region are Dalmatia to the southwest, Montenegro to the east, Mount Maglić to the northeast, and Mount Ivan to the north. Measurements of the area range from 11,419 km2 (4,409 sq mi), or around 22% of the total area of the present-day country, to 12,276 km2 (4,740 sq mi), around 24% of the country. A Cheta was an armed band organized by the mostly Bulgarian, Serbian, Albanian, Greek and Aromanian population on the territory of the Ottoman Empire that undertook anti-Turkish activity. The cheta was usually led by a leader, called voivoda. The members of the chetas were called chetniks. The Chetnik movement had its roots in the 19th-century Balkan liberation struggle against the Turks (Ottomans). The "Serbian Committee", made up of intelligentsia, businessmen and military officers, had initially funded small groups of brigands, either self-organized or part of the Bulgarian revolutionary organizations active in Macedonia (IMRO and SMAC), that were used to protect the Christian population from Ottoman atrocities and persecution. Serbia offered material support to the Ilinden Uprising (1903),  and after its suppression, authorities in Belgrade sought but failed to negotiate with Bulgarian leaders on sending Serbian bands (cheta) into Macedonia for combined Serbian-Bulgarian action. The Serbian Committee decided to fully organize their own groups, arming and sending the first bands from Serbia into Macedonia in springtime 1904. Soon, hostility on the field between the Bulgarian organizations and the Serbian Chetnik Organization began. With the failed idea of joint Serbian-Bulgarian action, and growing nationalism, the Serbian government took over the activities of the organization. As a consequence, the Chetniks simultaneously engaged the Ottomans (and their Albanian irregular bands) and Bulgarian bands in the 1904–08 period. Activities were temporarily stopped after the Young Turk Revolution (1908). The Internal Macedonian Revolutionary Organization was a revolutionary national liberation movement in the Ottoman territories in Europe, that operated in the late 19th and early 20th centuries. Supreme Macedonian-Adrianople Committee (SMAC),, also known as Supreme Macedonian Committee was a Bulgarian revolutionary political organization, active in the Macedonia and Thrace regions of the Ottoman Empire, which bases and main structures were in Bulgaria from 1895 to 1905. Macedonian Bulgarian and Thracian Bulgarian emigrants in Bulgaria were a great number. Led by Trayko Kitanchev, they formed in 1895 the “Macedonian-Adrianople Organization”, at the head of which was “Supreme Macedonian-Adrianople Revolutionary Committee”. Its official declaration was also a struggle for autonomy of Macedonia and Thrace. At the same time, being impatient for the liberty to come sooner, and strongly convinced that it would come only with the help of the Bulgarian Army. Later they directed their efforts in activities for involving the country into war with the Ottoman Empire. As a rule most of the leaders were with stronger connections with the governments. At the end their main idea was, waging struggle for a direct unification with Bulgaria. 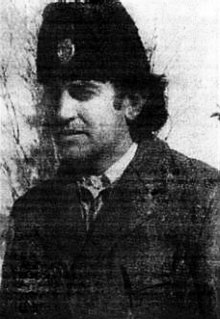 The Serbian Revolutionary Organization or Serbian Chetnik Organization was a revolutionary organization with the aim of liberation of Old Serbia from the Ottoman Empire. Its Central Committee was established in 1902, while the Serbian Committee was established in September 1903 in Belgrade, by the combined Central Boards of Belgrade, Vranje, Skopje and Bitola. Its armed wing was activated in 1904. Among the architects were members of the Saint Sava society, Army Staff and Ministry of Foreign Affairs. It operated during the Struggle for Macedonia, a series of social, political, cultural and military conflicts in the region of Macedonia; its operations are known as Serb Action in Macedonia. The Serbian Chetnik Organization, which had organized a guerilla faction that fought in Ottoman Macedonia between 1903 and 1912, was subsequently put under the supervision of the Serbian Army. During the Balkan Wars (1912–13), there were several Chetnik detachments. The First Balkan War, lasted from October 1912 to May 1913 and comprised actions of the Balkan League against the Ottoman Empire. The combined armies of the Balkan states overcame the numerically inferior and strategically disadvantaged Ottoman armies and achieved rapid success. In April 1942 the Communists in Bosnia established two Shock Anti-Chetnik Battalions (Grmeč and Kozara) composed of 1,200 best soldiers of Serb ethnicity to struggle against Chetniks. Later during the war, the Allies were seriously considering an invasion of the Balkans, so the Yugoslav resistance movements increased in strategic importance, and there was a need to determine which of the two factions was fighting the Germans. A number of Special Operations Executive (SOE) agents were sent to Yugoslavia to determine the facts on the ground. In the meantime, the Germans, also aware of the growing importance of Yugoslavia, decided to wipe out the Partisans with determined offensives. The Chetniks, by this time, had agreed to provide support for the German operations, and were in turn granted supplies and munitions to increase their effectiveness. Wikimedia Commons has media related to Chetnik collaboration with Axis occupation . Later the SRS became a government coalition partner of Milosević and in 1998, Đujić publicly stated that he regretted awarding that title to Šešelj. He was quoted as saying, "I was naïve when I nominated Šešelj [as] Vojvoda; I ask my people to forgive me. The greatest gravedigger of Serbdom is Slobodan Milošević"  and that he is "disappointed in Šešelj for openly collaborating with Milošević's Socialist Party, with Communists who have only changed their name. ... Šešelj has sullied the reputation of Chetniks and Serbian nationalism." In 2000, Ražnatović was assassinated before facing prosecution by the International Criminal Tribunal for the former Yugoslavia (ICTY). In 2003, Šešelj surrendered himself to the ICTY to face war crimes charges  and was acquitted in 2016. 1 2 3 Ramet 2006, p. 145. ↑ Tomasevich 1975, p. 146. ↑ Milazzo 1975, p. 31. ↑ Pavlowitch 2007, p. 63. ↑ MacDonald 2002, p. 142. ↑ Monier-Williams, A Sanskrit Dictionary (1899) "a troop of soldiers, army, host (MBh., BhP, Can)." ↑ Biliarsky 2007, pp. 316–317. ↑ Krakov 1990, pp. 147–166. ↑ Krakov 1990, pp. 168–172. ↑ Glas Javnosti& 26 May 2003. 1 2 3 4 5 Ramet 2006, p. 147. ↑ ( Karabegović 1988 , p. 145): " Bila je to najborbenija i politički najčvršća partizanska jedinica u to vrijeme u Krajini, organizovana od najboljih boraca iz krajiških ustaničkih žarišta - Kozare, Podgr- meča, Drvara, Petrovca i okoline." ↑ ( Petranović 1981 , p. 271): ", a novoformirani Grmečki protučetnički bataljon, od 800 boraca, operisao aprila-maja protiv četničkih jedinica Drenovića, Vukašina Marčetića i Laze Tešanovića. 1 2 Velikonja 2003, p. 167. ↑ Velikonja 2003, pp. 166–67. 1 2 Washington Times & 14 September 1999. ↑ Engelberg & 10 December 1991. ↑ Burns & 10 May 1992. ↑ Jungvirth & 14 June 2013. 1 2 Phillips & 23 July 2008. ↑ Strauss & 29 December 2003. ↑ MacDonald 2002, p. 138. ↑ Ramet, Sabrina P. (2005). Serbia since 1989: Politics and Society under Milopevic and After. University of Washington Press. p. 129. ISBN 9780295802077. ↑ Bećirević 2014, p. 46. 1 2 B92& 13 May 2006. ↑ HRT& 17 May 2005. ↑ B92& 13 May 2007. ↑ B92& 23 December 2004. ↑ Ćirić & 23 December 2004. ↑ Blic& 15 December 2009. ↑ Dalje& 29 September 2012. ↑ ESPN& 13 November 2004. ↑ Dnevnik& 27 August 2010. ↑ Dnevnik& 22 January 2007. ↑ B92& 11 June 2003. ↑ BBC& 19 May 2003. ↑ BBC& 20 June 2003. ↑ B92& 4 July 2003. ↑ B92& 7 July 2003. ↑ BBC& 7 July 2003. ↑ Vijesti& 13 August 2011. 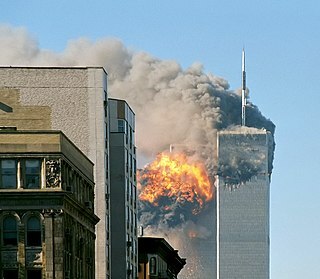 1 2 3 Pećanin & 2 August 2002. ↑ U.S. Department of State& 4 March 2002. ↑ Kebo & 1 May 2005. ↑ Slobodna Dalamacija& 13 July 2009. ↑ Index& 13 July 2009. ↑ B92& 13 July 2009. ↑ 24 sata& 7 August 2009. ↑ 24 sata& 24 February 2010. ↑ B92& 17 May 2005. ↑ Ristic & 6 March 2014. ↑ "Ukraine Crisis: Serb Chetniks Claim Killings of 23 Ukrainian Soldiers" . Retrieved 16 September 2016. Dragoljub "Draža" Mihailović was a Yugoslav Serb general during World War II and convicted war criminal. A staunch royalist, he retreated to the mountains near Belgrade when the Germans overran Yugoslavia in April 1941 and there he organized bands of guerrillas known as the Chetnik Detachments of the Yugoslav Army. Operation Uzice was the first major counter-insurgency operation by the German Wehrmacht on the occupied territory of the Kingdom of Yugoslavia during World War II. The operation was directed against the Užice Republic, the first of several "free territories" liberated by the Yugoslav Partisans. It was named after the town of Užice, and is associated with the First Enemy Offensive in Yugoslavian historiography. The security forces of the German-installed puppet regime of Milan Nedić also participated in the offensive. The Serbian State Guard or SDS was a collaborationist paramilitary force used to impose law and order within the German occupied territory of Serbia during World War II. It was formed from two former Yugoslav gendarmerie regiments, was created with the approval of the German military authorities, and for a long period was controlled by the Higher SS and Police Leader in the occupied territory. It was also known as the Nedićevci (Недићевци) after the leader of the Serbian pro-German puppet government, General Milan Nedić, who eventually gained control of its operations. It assisted the Germans in imposing one of the most brutal occupation regimes in occupied Europe and helped guard and execute prisoners at the Banjica concentration camp in Belgrade. Its leaders and much of the rank and file were sympathetic to the Chetnik movement of Draža Mihailović, and it was purged by the Germans on several occasions for that reason. In October 1944, as the Red Army closed on Belgrade, the SDS was transferred to Mihailović's control by a member of the fleeing Nedić administration, but it quickly disintegrated during its withdrawal west, with only a small number of former SDS members being captured by the British near the Italian-Yugoslav border in May 1945. 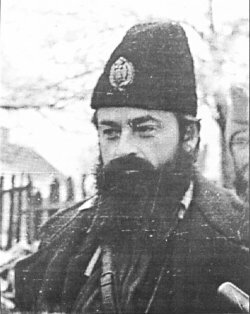 Momčilo Đujić was a Serbian Orthodox priest and Chetnik commander who led a significant proportion of the Chetniks within the northern Dalmatia and western Bosnia regions of the Independent State of Croatia during World War II. After the assassination of King Alexander of Yugoslavia in 1934, he joined the Chetnik Association of Kosta Pećanac. After the invasion of Yugoslavia, he defended local Serbs against the Croatian fascist Ustaše regime and collaborated with the Axis powers against the Communist-led Yugoslav Partisans throughout the remainder of the war as the commander of the Chetnik Dinara Division. He survived the war, surrendering to the western Allies and eventually emigrating to the United States. He was tried and convicted in absentia for war crimes by the Yugoslav government, including collaboration and responsibility for the deaths of 1,500 people during the war. Konstantin "Kosta" Milovanović Pećanac was a Serbian Chetnik commander (vojvoda) during the Balkan Wars, World War I and World War II. Pećanac fought on the Serbian side in both Balkan Wars and World War I, joining the forces of Kosta Vojinović during the Toplica uprising of 1917. Between the wars he was an important leader of Chetnik veteran associations, and was known for his strong hostility to the Yugoslav Communist Party, which made him popular in conservative circles. As president of the Chetnik Association during the 1930s, he transformed it into an aggressively partisan Serb political organisation with over half a million members. During World War II, Pećanac collaborated with both the German military administration and their puppet government in the German occupied territory of Serbia. 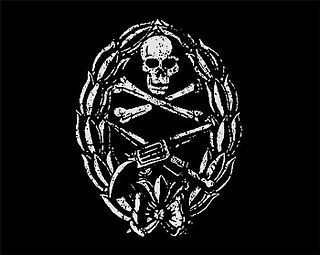 The Pećanac Chetniks, also known as the Black Chetniks, were a collaborationist Chetnik irregular military force which operated in the German-occupied territory of Serbia under the leadership of vojvoda Kosta Pećanac. They were loyal to the German-backed Serbian puppet government. Ilija Trifunović-Birčanin was a Serbian Chetnik military commander. He took part in the Balkan Wars and World War I and afterwards served as the president of the Association of Serb Chetniks for Freedom and the Fatherland in the Kingdom of Yugoslavia. Beginning in 1941 he collaborated with the Italians under the awareness and condonation of supreme Chetnik commander Draža Mihailović. In the spring of 1942, he was appointed by Mihailović as the commander of Chetniks in Dalmatia, Herzegovina, western Bosnia and southwestern Croatia. 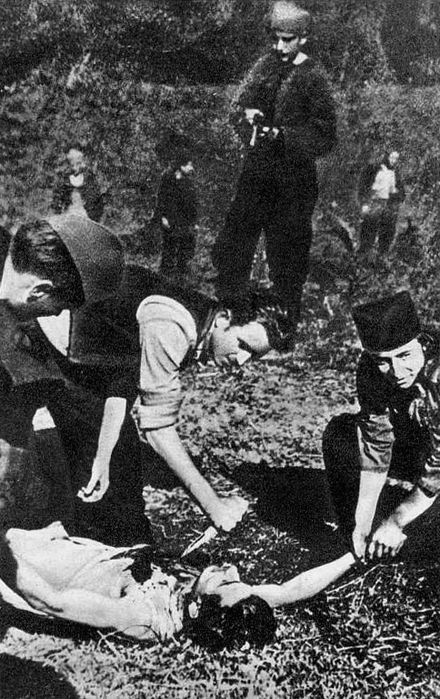 In October 1942, Trifunović-Birčanin and his subordinate commanders, Dobroslav Jevđević and Petar Baćović, were responsible for the killing of over 500 Bosnian Muslim and Bosnian Croat civilians in the Prozor region in October 1942. He died in Split on 3 February 1943, having suffered from poor health for a considerable period of time. 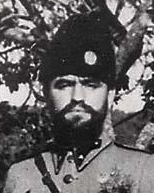 Ljubo Novaković was a Montenegrin officer in the Royal Yugoslav Army who became a Chetnik commander during World War II. He initially fought for the Chetniks of Draža Mihailović and those of Kosta Pećanac, but became disillusioned with both movements. He went to eastern Bosnia in late 1941, and raised Chetnik bands to fight Yugoslav Partisans there. He was captured by the Partisans in January 1942 and taken to Foča, where he was kept under constant surveillance. Partisan leader Josip Broz Tito likely believed that Novaković could be used to counteract Mihailović's influence among Chetniks in eastern Bosnia. Novaković left Foča with a British mission in April 1942 and returned to Montenegro with the intention of reassembling the disorganized Chetnik formations there. He was killed in late 1943, either by the Partisans or Mihailović's Chetniks. The Government of National Salvation, also referred to as the Nedić's government and Nedić's regime, was the second Serbian collaborationist puppet government, after the Commissioner Government, established on the German-occupied territory of Serbia during World War II. It was appointed by the German Military Commander in Serbia and operated from 29 August 1941 to October 1944. Unlike the Independent State of Croatia, the regime in the occupied Serbia was never accorded status in international law and did not enjoy formal diplomatic recognition on the part of the Axis powers. Uroš Drenović was a Bosnian Serb military commander in the Central Bosnia region of the Independent State of Croatia (NDH) during World War II. Following the German-led Axis invasion of Yugoslavia in April 1941, he joined the Yugoslav Partisans and distinguished himself during the initial uprising against NDH authorities by capturing Mrkonjić Grad in August 1941. Biliarsky, Tsocho (2007). Вътрешната македоно-одринска революционна организация (1893–1919 г.) – Документи на централните ръководни органи, Том I, Част I[The Internal Macedonian Revolutionary Organisation (1893–1919) – Documents of the central governing bodies, Volume I, Part I] (in Bulgarian). Sofia: Sofia University. ISBN 978-954-9800-61-6. Wikimedia Commons has media related to Chetniks .